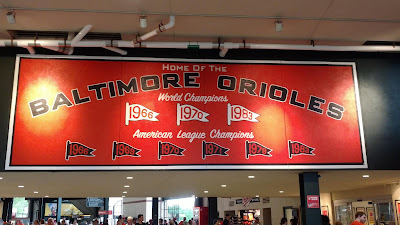 As we continued our way home from Florida, we stopped in Baltimore where the Orioles were hosting the Nationals in a three-game interleague set. 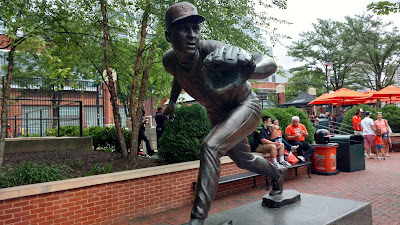 After an afternoon at the impressive Baltimore Museum of Art, I headed over to Oriole Park at Camden Yards for the final game of the series, with the Nationals looking to sweep behind Max Scherzer. 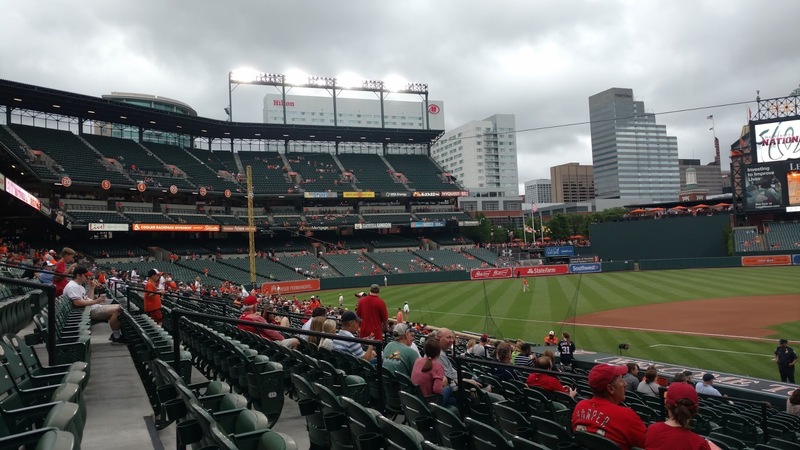 As you are probably aware, Camden Yards spawned the retro ballpark craze after it opened in 1992. 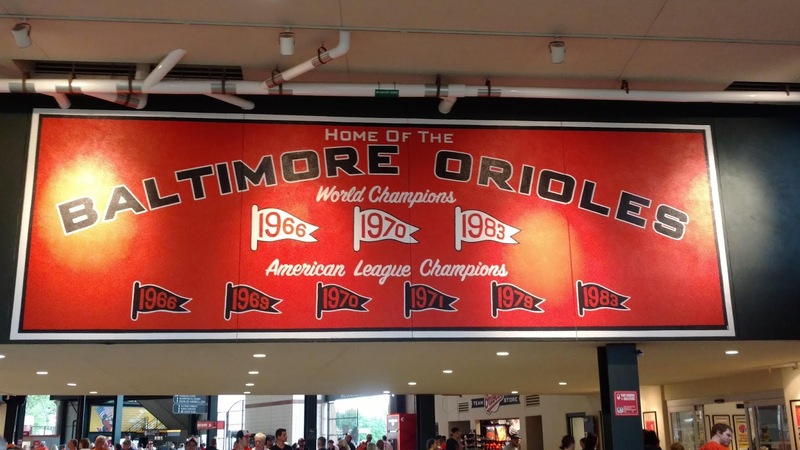 Now in its 27th year, it is showing its age in some spots (for example, many of the comfy seats were ripped and the foam was showing through), but it is still a great ballpark in most respects, with history recorded everywhere. Just inside the entrance at Eutaw and Camden is a picnic area with six bronze statues of Oriole greats added in 2012; that is obviously Cal Ripken below. Along the concourse you can see more, such as the signboard honouring the team's titles below. There is so much more to see here, but as I had been here many times before and did not show up until about 30 minutes before game time, I did not document it. 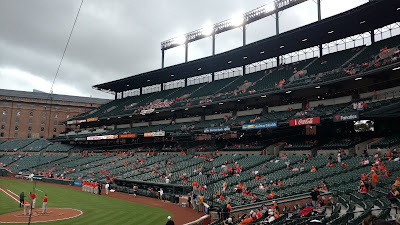 First time visitors must walk along Eutaw Street beyond the right field bleachers to see all the home run balls commemorated there. Much of my time was spent looking for the designated driver booth, which I walked past twice. The reason I did not notice it is that there was a huge line in front of it, a rare sight indeed. In most parks, there is no waiting to sign up for your free soda; at Camden Yards at least 30 people were patiently standing in line to save $5. I did not want to miss the start of the game, so I forsook the free Coke and headed to my seat. Despite this being an interleague rivalry featuring one of the best pitchers in the game, tickets were cheap and I picked up a single for far less than face. Many Washington fans were doubtless staying home to watch the Capitals in Game 1 of the Stanley Cup Final. The pictures above and below are from my seat, which was surrounded by fans of all types. Behind me were some foul-mouthed millennials, who, true to stereotype, talked incessantly about themselves, criticized everyone else in their group that wasn't there, and paid scant attention to the game. Glad that MLB caters to them. 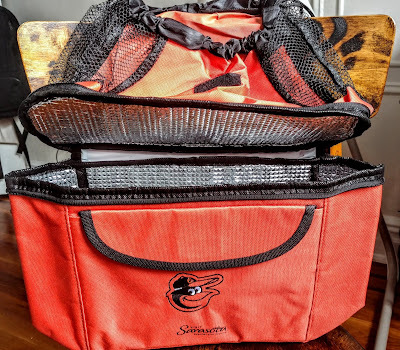 In front of me were four older gentlemen who played pass the hat - a game where all players contribute a buck at the start and the hat is then passed to the left for every Oriole batter. The holder gets the pot if the batter gets a hit, otherwise he contributes another dollar. With Scherzer on the mound for Washington, this could be a costly game for the losers. Next to me were a couple of entertaining Orioles fans who mostly commented humourously on those around us and cheered for every Scherzer strikeout. And they cheered a lot as Scherzer was dominant. 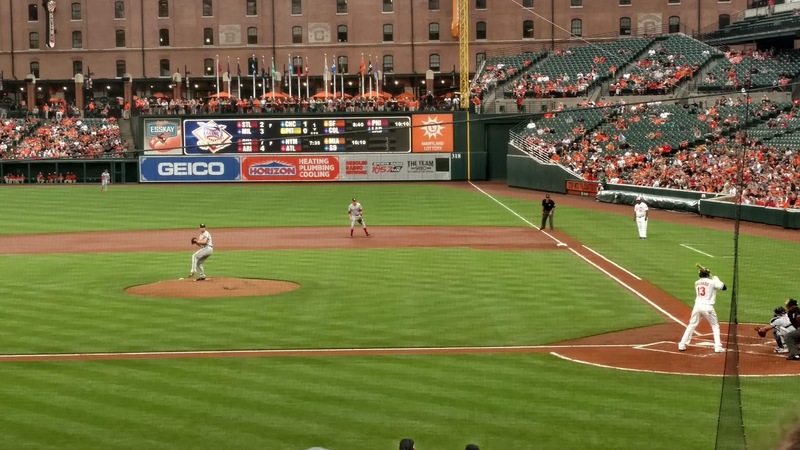 Whenever he pitches, there is a chance of a no-hitter, but Chris Davis, batting .150 on the year, ended that hope with an opposite-field poke in the 2nd inning. Bryce Harper hit a solo shot in the top of the 3rd off David Hess and rookie Juan Soto added an RBI single in the 7th, while Scherzer retired 14 in a row before Manny Machado (batting above) doubled in the 7th. 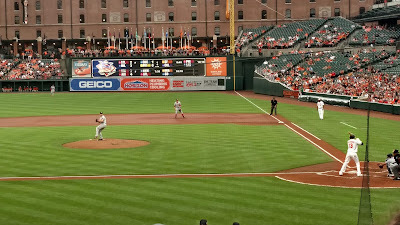 Scherzer later walked Mark Trumbo but worked out of that mini-jam and then retired the side in order in the 8th in a mild drizzle, finishing with a strikeout of Joey Rickard, his 12th K on the night. Sean Doolittle came out for the 9th and promptly gave up a single to pinch-hitter Craig Gentry. Adam Jones followed with a popup that fell between Harper and Wilmer Difo. Suddenly all of Scherzer's hard work was in jeopardy, but Gentry allowed himself to get picked off of second (with Machado at the plate no less) and the rally quickly fizzled as the Nationals won 2-0. A great game that took only 2:34 for 268 pitches for a PPM of 1.74, the fastest pace I've seen in the majors in some time. 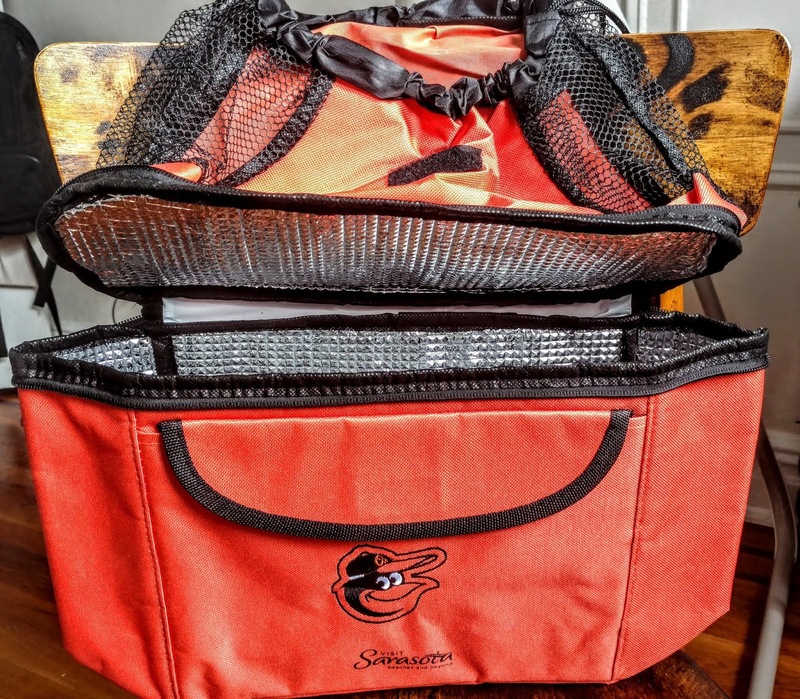 There was a giveaway of an Orioles cooler backpack to the first 20,000 fans. Announced attendance was 20,370 so there must be 370 fans who are lamenting missing out on this beauty.